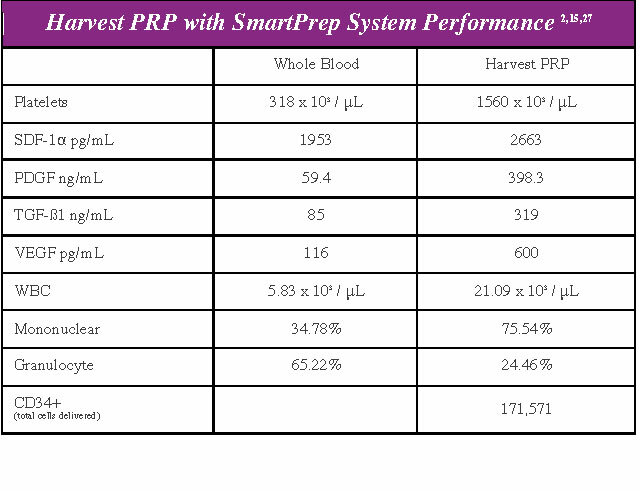 The Harvest PRP with SmartPrep® System consistently and reproducibly delivers the optimal concentration of platelets that may help optimize the conditions for healing. The Harvest PRP system selectively enriches and retains the mononuclear fraction of the white blood cell population.2,27 This fraction contains stem cells, identified by the cellular marker CD34+. Stem cells are a key component required for tissue regeneration. While enriching stem cell content, the Harvest PRP system also reduces granulocyte concentrations. 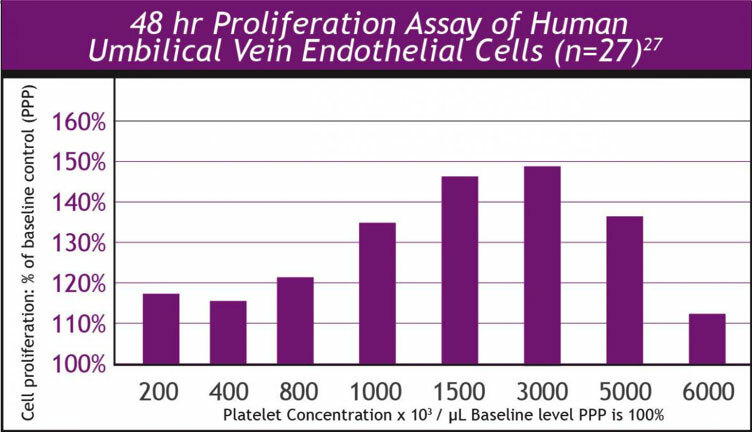 Harvest PRP contains 60% less granulocyte cell content compared to whole blood.2,27 Because of this reduction, Harvest PRP is not inflammatory. In addtion to stem cell content, Harvest PRP also provides concentrated amounts of the chemokine Stromal Derived Factor – 1 Alpha (SDF-1α).2,27 SDF-1α is known to act as a homing agent for stem cells and induce their migration to the repair site. The Harvest Technologies PRP separation system is designed to be used for the safe and rapid preparation of autologous platelet rich plasma (PRP) from a small sample of blood at the patients point of care. The PRP can be mixed with autograft and allograft bone prior to application to an orthopedic surgical site as deemed necessary by the clinical use requirements. It can be used to treat osteoarthritis and tendon injuries. 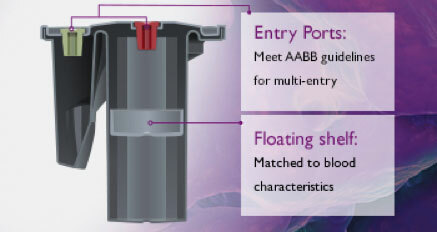 In addition the Harvest system has documented sterility of concentrated platelet product when following the manufacturer’s instructions for use.29 Instead of luer connectors that can be easily contaminated and cannot be disinfected, Harvest PRP disposables incorporate re-sealable injection ports that can be aseptically disinfected with alcohol prior to needle entry. Harvest PRP is the closest to a closed system on the market today. is truly the gold standard in PRP technology. A floating shelf build into every disposable self-calibrates based on the blood characteristics, and rises to just below the buffy coat/red blood cell interface to automatically optimize platelet recovery during the initial fractionation step. Harvest SmartPrep® Indications for Use. Jung Y, et al. Hematopoietic Stem Cells Regulate Mesenchymal Stromal Cell Induction into Osteoblasts Thereby Participating in the Formation of the Stem Cell Niche. Stem Cells. 2008;26:2042-2051. Matsumoto T, et al. Therapeutic Potential of Vasculogenesis and Osteogenesis Promoted by Peripheral Blood CD34-Positive cells for Functional Bone Healing. Am J Pathol. 2006;169:1440-1457. Matsumoto T, et al. Fracture Induced Mobilization and Incorporation of Bone Marrow-Derived Endothelial Progenitor Cells for Bone Healing. J Cell Physiol. 2008;215:234-242. Mifune Y, et al. Local delivery of Granulocyte Colony Stimulating Mobilized CD34-Positive Progenitor Cells Using Bioscaffold for Modality of Unhealing Bone Fracture. Stem Cells. 2008;26:1395-1405. Tondreau T, et al. Mesenchymal Stem Cells Derived from CD133-Positive Cells in Mobilized Peripheral Blood and Cord Blood: Proliferation, Oct4 Expression, and Plasticity, Stem Cells. 2005;23:1105-1112. Massberg S, et al. Platelets Secrete Stromal Cell-Derived Factor 1α and Recruit Bone Marrow-Derived Progenitor Cells to Arterial Thrombi In Vivo, J Exp Med. 2006;5:1221-1233. Hur J, et al. Identification of a Novel Role of T Cells in Postnatal Vasculogenesis: Characterization of Endothelial Progenitor Cell Colonies. Circulation. 2007;116:1671-1682. Kusumanto Y, et al. Platelets and Granulocytes, in Particular the Neutrophils, Form Important Compartments for Circulating Vascular Endothelial Growth Factor. Angiogenesis, 2003;6:283-287. Muschler G, et al. Comparison of bone marrow aspiration and bone core biopsy as methods for harvest and assay of human connective tissue progenitor. Scientific paper 41; presented at 58th Association of Bone and Joint Surgeons Meeting, 2006. Barrientos S, et al. Growth factors and cytokines in wound healing. Wound Repair Regen. 2008;16: 585-601. Nurden A, et al. Platelets and wound healing. Front Biosci. 2008;13:3525-3548. Zhang N, et al., Research progress in the mechanism of effect of PRP in bone deficiency healing. ScientificWorldJournal. 2013: Article ID 134582. Kevy S, Jacobson M. Comparison of methods for point of care preparation of autologous platelet gel. J Extra Corpor Technol. 2004;36:28-35. Giusiti I, et al. Identification of an optimal concentration of platelet gel for promoting angiogenesis in human endothelial cells. Transfusion. 2009;49:771-778. Marx RE. Platelet-rich plasma: Evidence to support its use. J Oral Maxillofac Surg. 2004;62:489-496. Marx RE. Platelet-rich plasma: A source of multiple Autologous growth factors for bone grafts. In: Lynch, SE, Genco, RG, Marx RE, eds. Tissue Engineering: Applications in Maxillofacial Surgery and Peridontics. Chicago: Quintessence Publishing Co, Inc.; 1999; 71-82. Gardner M, et al. The efficacy of autologous platelet gel in pain control and blood loss in total knee arthroplasty. Int Orthop. 2007;31:309-313. Zavadil P, et al. Autologous platelet gel and platelet-poor plasma and its efficacy as a prophylaxis to prevent implant-associated spinal infection. J Extra Corpor Technol. 2007;39:177-182. Li H, et al. Unique antimicrobial effects of platelet-rich plasma and its efficacy as a prophylaxis to prevent implant-associated spinal infection. Adv Healthc Mat. 2013,2:1277-1284. Kasakos K, et al. The use of autologous PRP gel as an aid in the management of acute trauma wounds. Injury. 2009:40:801-805. Bibbo C, et al. Union rates using autologous platelet concentrate alone and with bone graft in high risk foot and ankle surgery patients. J Surg Orthop Adv. 2005;14:17-22. Bocanegra-Perez S, et al. Use of platelet-rich plasma in the treatment of bisphosphonate-related osteonecrosis of the jaw. Int J Oral Maxillofac Surg. 2012;41:1410-1415. Marx RE, Harrell DB. Translational Research: The CD34+ Cell Is Crucial for Large-Volume Bone Regeneration from the Milieu of Bone Marrow Progenitor Cells in Craniomandibular Reconstruction. Oral Craniofac Tissue Eng. 2012;2;263-271. Hematology Basic Principles and Practice 5th Edition. Hoffman R, Benz Jr EJ, Shattil SJ, et al [Eds]. Churchill Livingstone Elsevier. Philadelphia, PA 2009. Kevy S, Jacobson M, Mandle B. Defining the composition and healing effect of platelet-rich plasma for regenerative medicine. Poster session presented at: TERMIS-Americas 2010, December 5-8, 2010, Orlando, Florida. Street J, et al., VEGF stimulates bone repair by promoting angiogenesis and bone turnover. Proc Natl Acad Sci USA. 2002;99:9656-9661. Center for Blood Research Laboratories, Sterility of platelet concentrates collected with the SmartPrep System and disposables, TR-063, 2001. El-Sharkawy H, et al. Platelet-Rich Plasma: Growth Factors and Pro- and Anti-Inflammatory Properties. J Periodontol. 2007;7:661-669. Fiore S, et al. Lipoxin A4 Receptor Activation is Distinct from that of the Formyl Peptide Receptor in Myeloid Cells: Inhibition of CD11/18 Expression by Lipoxin A4-Lipoxin A4 Receptor Interaction. Biochemistry. 1995;34:16678-16686. Alexander R. Use of microcannula closed syringe system for safe and effective lipoaspiration and autologous fat grafting. Am J Cosmet Surg. 2013;30:1-12. Alexander R, Harrell B. Autologous fat grafting: Use of closed syringe microcannula system for enhanced autologous structural grafting. Clin Cosmet Investig Dermatol. 2013;6:91-102. Alexander R. Understanding adipose-derived stromal vascular fraction (AD-SVF) cell biology and use on the basis of cellular, chemical, structural and paracrine components: A concise review. J Prolother. 2012;4:e855-869. Yamaguchi et al. Revascularization determines volume retention and gene expression by fat grafts in mice. Exp Biol Med. 2005;230:742-748. Defarges A, Abrams-Ogg A, Foster RA, Bienzle D. Comparison of sterna,, iliac, and humeral bone marrow aspiration in Beagle dogs. Vet Clin Pathol. 2013;1-7.